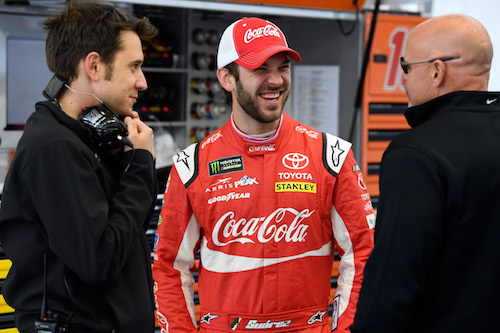 Stewart-Haas Racing has recently signed on Daniel Suarez to its Monster Energy NASCAR Cup Series lineup that is set to take place in 2019. The driver, who is originally from Mexico and recently turned 27, will be piloting the team’s No. 41 For Mustang, and has been given sponsorship from Haas Automation and ARRIS International PLC. He will be joining teammates Aric Almirola, Cling Bowyer, and Kevin Harvick. Suarez, talking about his new contract, said that it’s as the best birthday present that he could ask for. Originally born in Monterrey, Buevo Ledon, Mexico before moving to Huntersville North Carolina, is part of a new generation of growing talent within the NASCAR scene, and aim to provide fans with a new source of entertainment along with Formula 1 and the best online pokies Australia. Adding to his statement, Suarez commented on how competitive Stewart-Haas racing is – all their drivers won last year, and they all advanced into the play-offs – and explained that it was the opportunity that every driver wants, and he now has it. Finally he said that he hopes to deliver for both his team, Ford, ARRIS, Haas Automation, and ultimately for himself. Co-Owner of Stewart-Haas Racing, Tony Stewart, along with Haas Automation founder Gene Haas, have stated that they believe Suarez’s ascension to the NASCAR Cup Series is more than enough proof his drive and talent. Speaking about Suarez, the pair stated that in each series the driver has raced in, he has advanced extremely quickly from rookie driver to race winner. They added that within four years, he went from the K&N Series to the NASCAR Cup Series, and in between, he won the Xfinity Series, and he did while learning a new language and integrating into a new culture – finishing off by remarking that he was a dedicated and talented driver and that they were proud to have him as part of their team. Suarez’s career as a racer started back in 2002 when he began to compete in go-kart racing. He won the Mexican national championship some years later in 2007, after which he received a letter of invitation to compete in the Rotax World Championships. A year later, he joined a mini-stick division, which was part of an official support series of the NASCAR PEAK Mexico Series. He went on to win 10 races in the NASCAR PEAK Mexico series before moving over to the United States, where he began racing in the NASCAR K&N Pro Series. His wins began to pile up quickly, and he won three times in 2013 before he moved over to the Xfinity Series. From there, he earned the 2015 Xfinity Series Rookie of The Year Award before advancing to his championship season in 2016, winning three races, and scored three poles with an impressive 19 top-five and 27 top-10 finishes.